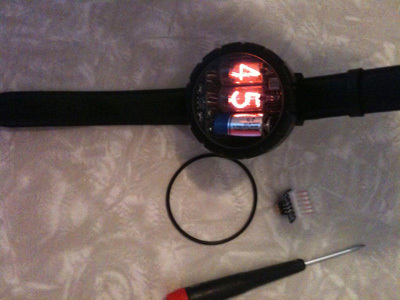 Breaking: Cathode Corner Nixie watch for sale on eBay. Starting bid at $305 + shipping from Canada. These originally sold for just short of $400 so this looks like a pretty good deal. The photo is of the actual item in auction. More information is available below from the link to Cathode Corner. Besides, the Woz has one. That instantly makes it cool. This cool limited edition Nixie tube watch can be yours. This Nixie Watch displays the time on nixie tubes, which are quaint neon display tubes once used in calculators in the dawn of recorded history (1969). It is a two-digit wristwatch designed for everyday use, being water-resistant and rugged. The watch requires no button pushing to operate - it shows the hours, minutes and seconds in sequence at the flick of the wrist. This item is in excellent 9.9/10 condition and was worn twice!. Manufactured by Cathode Corner. Shipping is $17 to USA and $14 to Canada. $21 to EC. TubeClockDB.com is looking for more user submitted clocks and creations. Do you have something that you would like to show off? Contact us. We will host all of the images and videos and you can even link to them in forums, on eBay auctions, etc. You don't even have to have a website - just email us the photos and descriptions and we will handle the rest. You will still own the copyright to all images, descriptions, video, etc. and all credit will be given to you. 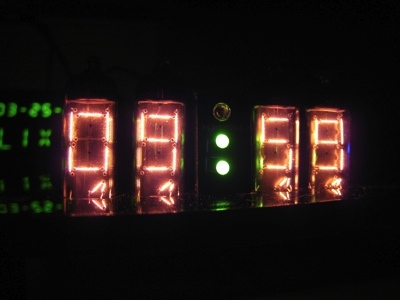 The reason we are doing this is that we want to be the central resource for Nixie Clocks. There are many great designs in the nixie community and we want people to be able to see your work and draw inspiration from them. Do you have more commercial intents? Not a problem. 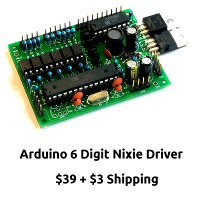 If you sell nixie clocks or related products, let us know and we will add you to our recommended sellers list. Just a quick update - Jon Ellis has 3 more of his Numimini available for sale on eBay. If you don't have one of these, stop what you're doing and go pick one up. Seriously, this is my favorite clock in my collection.